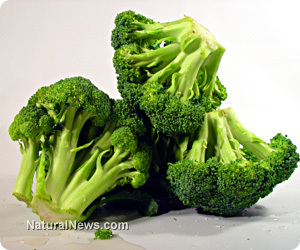 (NaturalNews) Scientists have been mounting evidence to support the cancer-fighting abilities associated with consuming broccoli and other members of the crucifer family for more than a decade. Past studies have shown that this super-food family directly influences the expression of more than 400 genes immediately after eating the tasty vegetables. Further research bodies have also shown that broccoli consumption can play an important role in lowering the risk of developing cardiovascular diseases, and yet to date, the precise metabolic pathway for disease prevention has largely been unknown. A team of research scientists from Britain's Institute of Food Research have published the results of their work in the American Journal of Clinical Nutrition to explain how metabolic modifications brought about by consumption of high-glucoraphanin broccoli may be behind the suggested health benefits and cancer-fighting ability of the cruciferous vegetable family. Scientists noted that this study provides the first evidence from human studies for a possible mechanism behind the suggested ability of glucosinolates, including glucoraphanin found in broccoli, to reduce the risks of chronic diseases and cancers. Researchers fed a special cultivar of broccoli, a combination of wild and commercially available broccoli that contains high levels of glucoraphanin, to nineteen volunteers each week for three months. They compared the first group to two other groups eating the same diet, except one consumed commercially available broccoli and the third ate none of the crucifer. The team observed that those eating the glucoraphanin-rich vegetable showed signs of an improved metabolism. The scientists determined that a compound commonly found in crucifers, known as sulforaphane, improved the chemical reactions inside mitochondria, the power source for our cellular machinery. The study found that glucoraphanin helped 'retune' metabolic processes in the cells that get disrupted as we age. Lead author, Dr. Richard Mithen commented, "We think this provides some evidence as to why people who eat diets rich in broccoli may keep in good health... mitochondria are really, really important, and when they start to go wrong it leads to many of the diseases of aging." The nutritionists performing the study recommend eating broccoli two to three times a week. Other health-promoting members of the cruciferous vegetable family include Brussels sprouts, kale and cauliflower. Dr. Mithen concluded "We think it is significant because it shows in humans a measurable effect on our metabolism, which is central to our overall health and could explain the diverse range of beneficial effects many observational dietary studies have shown previously." It is important to note that while this study used a specially concentrated type of broccoli to produce the stated results, consumption of commercially available broccoli and crucifers have been shown to exhibit similar anti-cancer properties when eaten over a longer period of time.